Gorgeous move-in-ready Leucadia Collection home nestled on a quaint cul-de-sac West of the 5! With top of the line fixtures & exquisite modern finishes thru-out, this home is sure to amaze. Features: highly upgraded kitchen w/high-end appliances, quartz counters, spacious open concept family & dining rooms, 1st floor master bed + additional bed & bath on 1st floor, upstairs beds have their own en-suites, smart-house tech, whole-house solar, great entertaining yard w/dining area, covered patio & firepit., This turn key & modern home lives like a single story & has something to offer to all. The moment you step inside, you are greeted by a vast entry w/cathedral vaulted ceilings. Continue through to the dining room which flows into both the kitchen & family room. The gourmet kitchen features high-end stainless steel appliances, including a Wolf 6 burner gas range & Sub-Zero refrigerator. 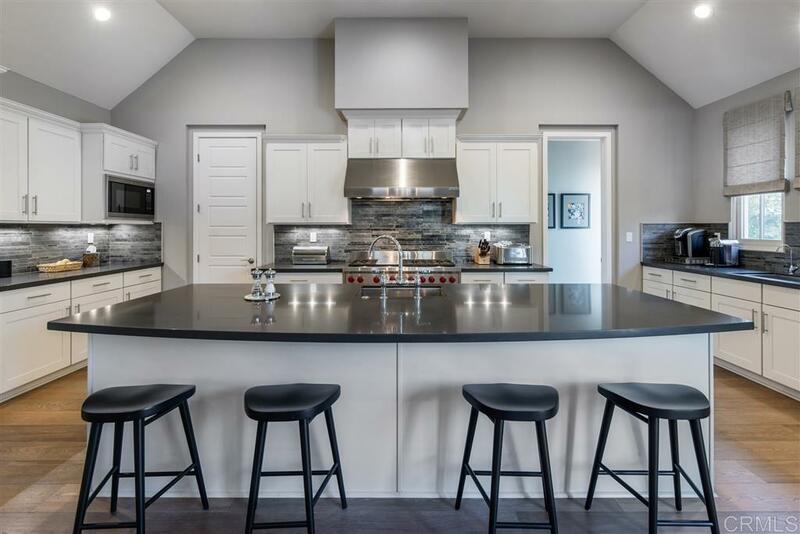 It also features 2 sinks, custom backsplash, gorgeous quartz counters & huge center island. The family room offers a gas fireplace & access to the outdoor dining area. The expansive master suite comes complete w/a large walk-in closet w/custom built-in organization, dual glass doors that lead to the yard & a spa-like master bath w/marble counters, center soaking tub, walk-in shower & high-end Toto toilet. The additional entry level bed can also be used as an office with its built-in shelves & small walk-in closet for extra storage. Upstairs features 2 more bedrooms each with their own en-suite baths. Plenty of room to entertain or for play in the large yard with multiple lounging/eating areas. This quiet cul-de-sac features an enclave of only 19 houses. Great location close to award-winning schools, beautiful beaches, hiking trails, Del Mar Racetrack, Cottonwood Creek park & downtown Encinitas Village with multiple restaurants, shops & nightlife. This is coastal living at its finest!